The Pittsburgh Penguins have one of the most rabid fan bases in the NHL so it is not surprising there is a lot of excitement about the 2012 NHL Draft this weekend in the Steel City. UD enjoys a great relationship with the NHL and we are extremely excited about have a big presence at the 2012 NHL Draft starting on Friday, June 22. For fans in attendance, we want to encourage all puck fans in attendance to stop by the Upper Deck booth for what should be a memorable experience. For fans who purchase just three (3) packs of any 2011-12 Upper Deck Hockey they can receive an exclusive 2012 NHL Entry Draft 6-card set! Collectors can score these limited cards of top players like Sidney Crosby, Alex Ovechkin, Steven Stamkos, Evgeni Malkin, Marc-Andre Fleury and Jaromir Jagr. Card packs must be opened at the Upper Deck booth and they are available only while supplies last! Additionally Upper Deck invites fan to be a part of the game by offering fans the opportunity to have their own personalized Upper Deck NHL trading card produced. Fans can pose with a professional photographer in a NHL jersey and their trading card will be produced right there. 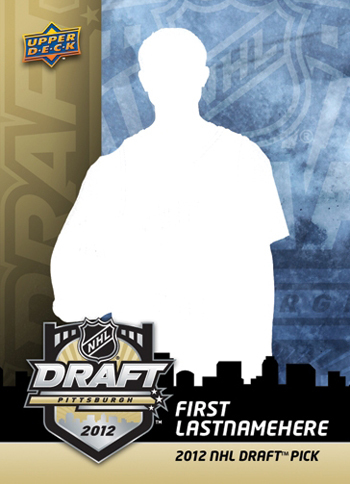 Fans can get their very own Upper Deck NHL trading card at the 2012 Draft in Pittsburgh this weekend! Behind the scenes the Upper Deck Athlete Relations Team will be collecting some autographs and other items from all the top draft picks for promotional purposes. Also we will be working with Upper Deck’s 2012 NHL Draft Runner; Salvatore Cerilli who will be working along with an actual NHL team as they pick their future stars. Salvatore will actually be on Cardboard Connection Radio this Wednesday night so make sure to tune in to hear what he has to say about being selected. 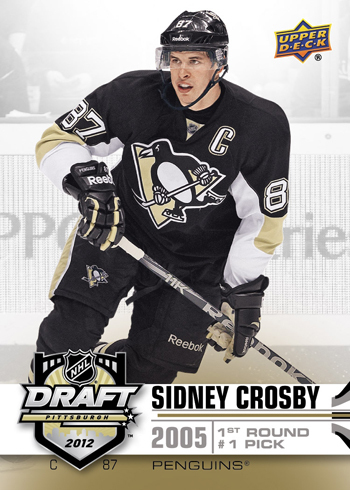 Get this Sidney Crosby NHL Draft Upper Deck card at the 2012 NHL Draft! If you are in the Pittsburgh area, make sure you are a part of the 2012 NHL Draft! je suis interessé à avoir des paquets de cartes du repechage. comment je fais pour en avoir? ?